Vidalytics is an end-to-end video solution aimed towards marketing professionals whose approach is anchored on online video marketing. This platform is an ideal software for all sorts of marketing strategies – direct response, product launches, lead generation, branding, or kickstarters. Vidalytics combines video hosting and analytics, enabling marketers to host and stream videos while at the same time, go deeper into the performance of their materials to gather analytics to measure the effectiveness of their videos, improve conversions, enhance sales, and drive business growth. The software gives you the ability to probe beneath the surface of your video marketing campaigns and provide you with the best marketing intelligence. Vidalytics is a perfect platform for online marketers, marketing firms, and companies invested in online videos. The software is loaded with traditional features one would expect from a video hosting platform – streaming, hosting, etc. But apart from the usual tools and capabilities, Vidalytics brings something else to the table that no other platforms in its league fail to deliver – powerful analytics. With Vidalytics, you are able to fully optimize your online videos, exponentially increasing its potential to reach out to more people, cover your desired markets, generate high-quality leads, and bolster your revenue and business growth. The software gives you an x-ray view into the performance of your videos, telling you details that otherwise go undiscovered while your audience is viewing your materials. There are tons of analytics tools out there, but nothing delivers you the analytics of your videos like Vidalytics does. You want the story behind who’s watching your videos and how they interact with them. Vidalytics displays the performance of your videos per user and what’s going on per second. You will know which part people find interactive and engaging, the scenes where they lose interest and identify the factors that impact conversions. All these information provides you with the insights you need to further improve your video marketing efforts, bring you better marketing results, and humongous sales. What Problems Will Vidalytics Solve? 1. Conversion tracking: If a company sells with video, they have no way to know what videos their customers watched before converting. 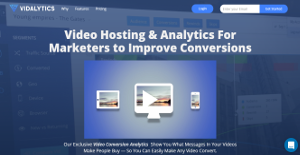 With Vidalytics’ conversion tracking, each conversion is attributed back to the video(s) watched by the user before converting. 2. Segmenting video data: Other video platforms don’t offer detail info into how people interact with videos. Vidalytics allows users to segment their video data by traffic type, location, device, browser, buyers, and non-buyers, as well as first-time viewers vs. repeat viewers. 3. Compare view: If running a split test or simply wanting to compare 2 videos you’re using to sell, you had to have different tabs open or jump back and forth from video to video. Now, you can see the video performance of 2 videos side by side, and even hover over one to see the same spot on both videos, to dig deeper into each section of each video. Each organization has different requirements and requires a system that can be customized for their size, kind of employees and customers, and the particular industry they are in. For these reasons, no system can proffer perfect tools out-of-the-box. When you try to find a software product, first be sure what you need it for. Read some Vidalytics reviews and ask yourself do you need basic features or do you want sophisticated tools? Are there any industry-specific functionalities that you are searching for? Get the answers to these queries to help your search. There are plenty of elements that you need to reflect on and these include your budget, specific business needs, your company size, integration needs etc. Take your time, check out a few free trials, and finally zero in on the system that offers all that you want to boost your organization effectiveness and productivity. How Much Does Vidalytics Cost? We realize that when you make a decision to buy Marketing Software it’s important not only to see how experts evaluate it in their reviews, but also to find out if the real people and companies that buy it are actually satisfied with the product. That’s why we’ve created our behavior-based Customer Satisfaction Algorithm™ that gathers customer reviews, comments and Vidalytics reviews across a wide range of social media sites. The data is then presented in an easy to digest form showing how many people had positive and negative experience with Vidalytics. With that information at hand you should be equipped to make an informed buying decision that you won’t regret. What are Vidalytics pricing details? What integrations are available for Vidalytics? If you need more information about Vidalytics or you simply have a question let us know what you need and we’ll forward your request directly to the vendor.